Situated on a cliff that overlooks the town of St Andrews, the Fairmont is one of our favourite hotels in the area and it’s ideal for large groups. It has very flexible event space, several dining options, a great spa and two golf courses. Hands down it offers the best hotel breakfast for miles! What would a group get to do there that a normal visitor wouldn’t? Take the hotel on exclusive use and turn the atrium into a welcome party, with live music, food stations and entertainment. Golf: Play a round or have some coaching at the home of golf….boasting some 11 golf courses in the area, the group will be spoilt for choice. Spa: The spa at the Fairmont is the ideal way to relax and be pampered. Active outdoors: St Andrews is right on the coast so if your group are an active bunch, arrange for some land-yachting, paddle boarding, zapcats, kayaking and more! Walking tour: St Andrews is steeped in Scottish history so your group must take in the castle, the cathedral, the university and the golf. Motorsports: Take the adrenaline junkies of your group to Scotland’s national motorsports circuit for a supercar driving experience. Leisure time & lunch: Browse the many gift shops, traditional pubs and the quaint harbour of St Andrews. Stop for lunch at Forgans. Situated in the heart of St Andrews this rustic, welcoming restaurant offers great flexibility for group dining, from exclusive use, to hiring one of the four ‘bothies’. The food is locally sourced and cooked to perfection. Scotland’s original combined distillery and brewery. 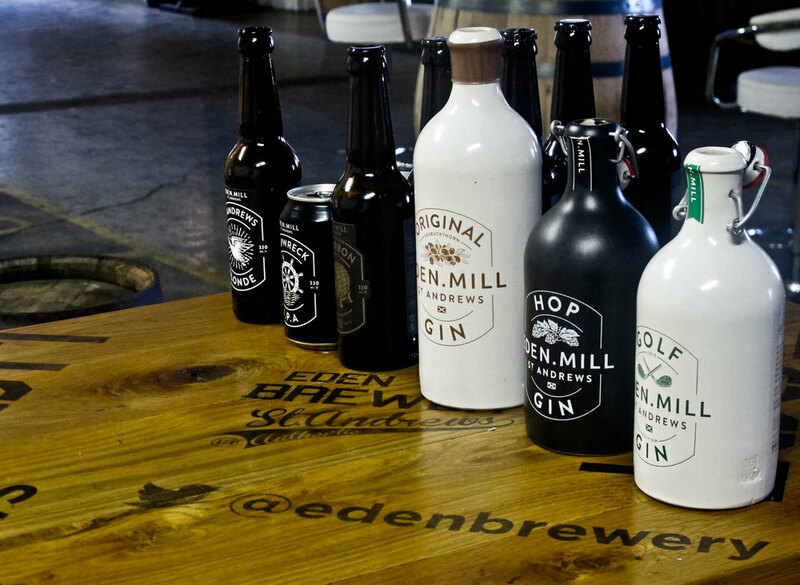 Small but very special, Eden Mill brews craft beer, distills exclusive malt whiskies and seasonal gins. See how all three drinks are created and how the small team operates much of the processes by hand! A fascinating experience and a real alternative to larger more industrial distilleries. It’s also great for the ladies who may prefer gin to whisky! Finish off with a tasting flight and a browse in the shop. Combine an early evening tour and tasting with a rustic dining experience and a ceilidh – only available to selected groups, not open to the public. Founded in 1413 and famed to be the meeting place of Prince William and Princess Kate, the University of St Andrews is a must. On the main quadrant there are two historic venues – the impressive Lower College Hall and the Upper College Hall. The Lower College is ideal for a grand gala dinner, then guests can kick back in the Upper College Hall with its dance floor and beautiful wood-panelled bar. Just across the road from the Cathedral ruins, sits one of the university’s postgraduate residences. The building dates back to the 15th century, has an unusual underground dining area and the most beautiful walled garden. Use of the dining room and the garden is limited and must be approved by the residence; it’s a totally exclusive experience in St Andrews. A brand new whisky distillery just outside in a converted farm steading that dates back to the 1800’s. They have a fabulous guided tour and you can even sample the New Spirit Drink – the spirit before it matures into whisky! Have an exclusive tour then dine in one of the event spaces, including the ‘rotunda’ reception, the sensing zone or the tasting room. If you'd like to consider St Andrews for your next incentive group, get in touch and we can share some more great ideas!